Gum is a part of the mucous membrane that surrounds the cervical part of the tooth and covers the alveolar process of the jaws (Fig. 1-3,1-4). In the end coronal to cementoenamel junction (FAC) of each tooth and attached to the tooth using a specialized type of epithelial tissue (paroxizmalnaya form epithelium). It consists of a thin outer layer of the epithelium and the base of connective tissue. Gum is divided into four anatomical areas (Fig. 1-3). Gums protects base supporting structures of the tooth periodontal from the oral environment. In the oral environment is subjected to a wide range of temperatures in food and drink, mechanical strength, and a large number of bacteria in the mouth. To perform these functions, gums has several defense mechanisms, including saliva and protection mechanisms of the immune system. Coronal the turn of the gum - gum edges (Fig. 1-5). Apical the turn of the gums is the mucic of alveolar process. Alveolar mucosa can be easily distinguished from gum to her dark red color and smooth, shiny surface. 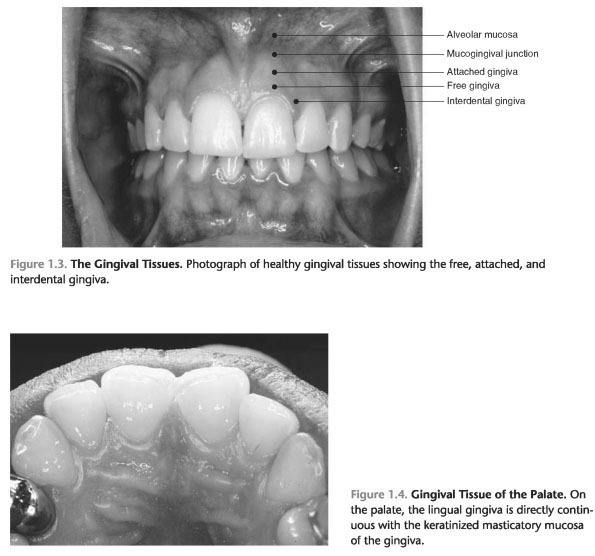 Free gum shallow grooves linear depression, which separates the free and attached gingiva (Fig. 1-5). This line can be clinically visible, but not obvious, in many cases. In mucogingival transition is clinically visible border, where attached gingiva of pink corresponds to red, shiny mucic of alveolar bone (Fig. 1-5). Clinically visible means that this target can be seen in the oral cavity.